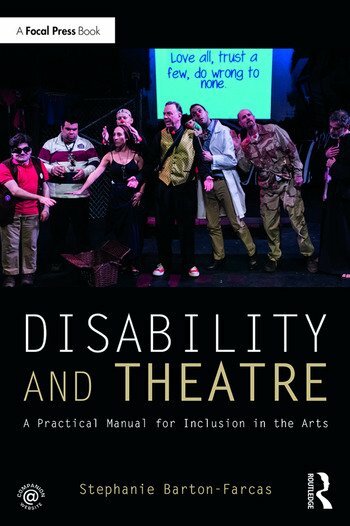 Disability and Theatre: A Practical Manual for Inclusion in the Arts is a step-by step manual on how to create inclusive theatre, including how and where to find actors, how to publicize productions, run rehearsals, act intricate scenes like fights and battles, work with unions, contracts, and agents, and deal with technical issues. This practical information was born from the author’s 16 years of running the first inclusive theatre company in New York City, and is applicable to any performance level: children’s theatre, community theatre, regional theatre, touring companies, Broadway, and academic theatre. This book features anecdotal case studies that emphasize problem solving, real-world application, and realistic action plans. A comprehensive Companion Website provides additional guidelines and hands-on worksheets. CHAPTER 1: WHY THIS BOOK? CASE STUDY 1: A Seizure on stage. NICU’S SPOON Theater Company, New York City. CHAPTER 2: WHAT IS INCLUSION? A: The most standard misconceptions people have about disability and inclusion and why they are wrong. B: The reasons theaters, college training programs or practitioners are not inclusive. C: The wrong reasons to be inclusive. CASE STUDY 2: Stage Manager in a wheelchair. NICU’S SPOON Theater Company, New York City. CASE STUDY 3: Disabled artist as villain. NICU’S SPOON Theater Company, New York City. CHAPTER ACTION: Write an audition ad. CASE STUDY 5: Can an actor who is deaf speak? NICU’S SPOON Theater Company, New York City. CASE STUDY 6: Snow White & Richard III, NICU’S SPOON Theater Company, New York City. CASE STUDY 7: Think outside the box for accessible sets and non-standard staging. NICU’S SPOON Theater Company, New York City. CHAPTER ACTION: A seven point list of how to proceed to do a cast dance for a period play. CASE STUDY 9: A large disabled and diverse cast in technical rehearsal. NICU’S SPOON Theater Company, New York City. CHAPTER ACTION: The strike worklist and delegating. CASE STUDY 11: A blind actor and discovering colors. NICU’S SPOON Theater Company, New York City. CASE STUDY 12: THAT UPPITY THEATER COMPANY, St. Louis, Missouri. CHAPTER ACTION: How well is your institution doing? CASE STUDY 13: The Glass Menagerie, a personal case study. Christine Bruno. CASE STUDY 14: TBI and mental disabilities. NICU’S SPOON Theater Company, New York City. CHAPTER ACTION: Assess your theater for sustainability. CASE STUDY 15: GIDEON PRODUCTIONS, New York City. Stephanie Barton­-Farcas is the Artistic Director of Nicu’s Spoon Theater Company. Founded in 2001, it is the first company in NYC history to be fully inclusive (age, gender, color, religion, disability, nationality). She is also the co­founder of the Disability Cinema Coalition. She recently directed Richard III with a disabled cast except for the title role and her company Nicu’s Spoon is the subject of the documentary Two and Twenty Troubles which follows the production of The Cherry Orchard and four of the disabled actors in it. She has been profiled in The NY Times, Variety, American Theater Magazine and Playbill as a director and advocate. As a writer she has been published in Backstage, Howlround and many other disability or theater publications as well as lecturing and teaching at SAGAFTRA, AEA and many film and theatre industry associations and colleges (Columbia, NYU) in the US and in Europe (CEU in Hungary, University of Riga, University of Kiev, Royal Conservatoire Scotland among others) about inclusion in the arts.